Peptide (C)NSLPMESTPHK*SRGS, corresponding to amino acid residues 605-619 of rat TRPV1 with replacement of cysteine 616 (C616) with serine (*S) (Accession O35433). 3rd extracellular loop. Homology Specific to rat TRPV1. Specificity Recognizes TRPV1 from rat only. Standard quality control of each lot Western blot analysis (unlabeled antibody, #ACC-029), and immunohistochemistry (labeled antibody). 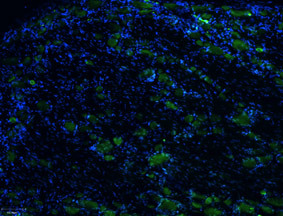 Immunohistochemical staining of rat dorsal root ganglion (DRG) frozen sections using Anti-Rat TRPV1 (VR1) (extracellular )-ATTO-488 Antibody (#ACC-029-AG), (1:50), (green). 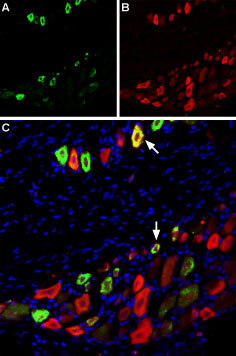 TRPV1 is expressed in medium and small DRG neurons. Hoechst 33342 is used as the counterstain (blue). Cell surface detection of TRPV1 in intact living Pheochromocytoma (PC12) cells. 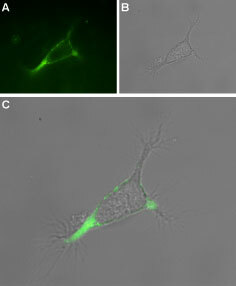 A. Extracellular staining of cells using Anti-Rat TRPV1 (VR1) (extracellular)-ATTO-488 Antibody (#ACC-029-AG), (1:25), (green). B. Live view of the cell. C. Merge images of A and B.
Gunthorpe, M.J et al. (2002) Trends. Pharmacol. Sci. 23, 183. Agopyan, N. et al. (2004) Am. J. Physiol. 286, L563. Reilly, C.A. et al. (2003) Toxicol. Sci. 73, 170. TRPV1 channel has many activators; among them heat, protons, vanilloids like capsaicin, resiniferatoxin (RTX), and lipids. This channel is associated with tissue injury and inflammation.6,7 TRPV1 is expressed predominantly in nociceptors and in sensory neurons. Immuno-colocalization of TRPV1 and mGluR5 in rat DRGImmunohistochemical staining of rat dorsal root ganglion using Anti-Rat TRPV1 (VR1) (extracellular)-ATTO-488 Antibody (#ACC-029-AG), (1:60) and Anti-mGluR5 (extracellular)-ATTO-594 Antibody (#AGC-007-AR), (1:60). A. TRPV1 staining (green). 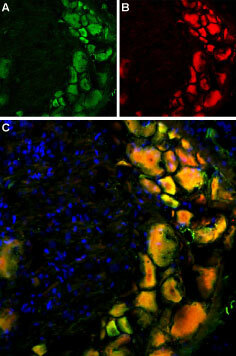 B. mGluR5 staining of the same section (red). C. Merge of A and B demonstrates co-localization of TRPV1 and mGluR5 in DRG cells. Nuclei were stained using DAPI as the counterstain (blue). Anti-Rat TRPV1 (VR1) (extracellular) Antibody (#ACC-029) is a highly specific antibody directed against an extracellular epitope of the rat TRPV1 channel. The antibody can be used in western blot, immunohistochemistry, and live cell imaging applications. It has been designed to recognize TRPV1 from rat samples only. Anti-Rat-TRPV1 (VR1) (extracellular)-ATTO-488 Antibody (#ACC-029-AG) is directly labeled with an ATTO-488 fluorescent dye. ATTO dyes are characterized by strong absorption (high extinction coefficient), high fluorescence quantum yield, and high photo-stability. The ATTO-488 label is analogous to the well known dye fluorescein isothiocyanate (FITC) and can be used with filters typically used to detect FITC. Anti-Rat-TRPV1 (VR1) (extracellular)-ATTO-488 Antibody has been tested in immunohistochemistry and live cell imaging applications and is especially suited for experiments requiring simultaneous labeling of different markers. Anti-Rat TRPV1 (VR1) (extracellular) Antibody (#ACC-029), (for western blot analysis). Anti-TRPV1 (VR1) Antibody (#ACC-030). This antibody recognizes a different epitope and thus can also be used as a control for detecting TRPV1. Anti-Rat TRPV1 (VR1) (extracellular) Antibody (#ACC-029). This antibody recognizes a an extracellular epitope and can be used to detect TRPV1 in live cells.